Order Bio D Fragrance Free Hand Wash 5 l from the Online Health Food Store UK. Buy Bio D fragrance free sanitising hand wash 5000ml and other quality Liquid Hand Wash safely online in the UK. Fast acting anti-bacterial fragrance free hand wash. Kills 99.9% of harmful bacteria whilst being gentle on your skin. As official Bio D stockist in the UK, we sell quality Liquid Hand Wash to customers throughout the UK in England, Wales, Scotland and Northern-Ireland. View more products on the Online Health Food Store from Bio D.
Where to buy Bio D Bio D Fragrance Free Hand Wash 5 l safely online? 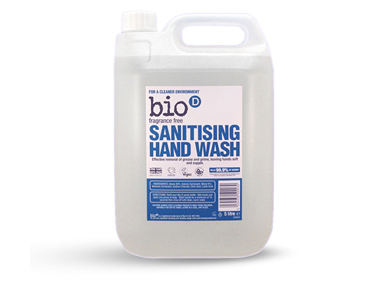 Shop at the Online Health Food Store if you are wondering where you can buy Bio D fragrance free sanitising hand wash 5000ml safely online in the United Kingdom. Our Health Shop is located in the UK and our award-winning independent has been serving customers in England, Wales, Scotland and Northern-Ireland since 1976. You can buy our Hypoallergenic, vegan and environmentally friendly cleaning products and other quality Liquid Hand Wash online and we post out orders to any UK address.